I haven’t been able to get this young boy out of my mind after watching him wander around his yard with a long face and puffy eyes. Gripping his little homemade slingshot, he kicked around in the mud next to a pigpen near his home on the outer island of Fefan, Chuuk. Fefan is one of many of the inhabited islands in Chuuk State that towers up out of crystal clear water and is covered with a lush mantle of thick jungle. The people of Fefan are welcoming and friendly, eager to share a warm Chuukese smile and extend a hand to the visitors of their beautiful island home. For its four thousand residents, life on Fefan is simple but not easy considering the island has no electricity, running water, medical facilities, or public utilities of any kind. They have learned to do without many of those things that most of us never give a second thought to. But that day as I squatted down next to the boy I was having second thoughts. Yes, I was sad that this boy didn’t have access to conveniences that are commonplace for many, but that’s not what bothered me the most. This may sound strange, but what bothered me was that he didn’t have access to Sabbath School, Vacation Bible School, Pathfinders, or to the attention of fun-loving, dedicated, Student Missionary teachers that the boys and girls on some of our other islands in Guam-Micronesia Mission do. Fefan has none of these. 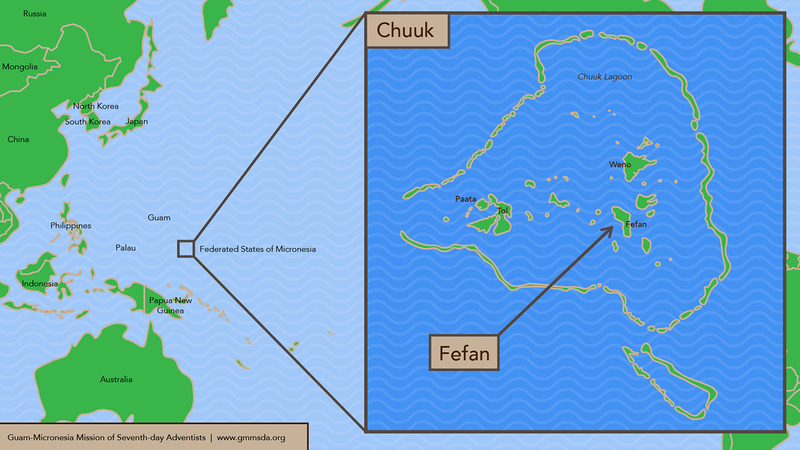 Fefan is one of thirty-seven inhabited islands in Chuuk State that has no Adventist presence. Chuuk has a total of forty inhabited islands and the vast majority of them are unreached with the truth of Jesus and the Adventist message. Yes, it saddens me that young boys and girls on islands like Fefan don’t have access to the common conveniences of life, but it truly unsettles me that they don’t have access to a clear picture of Jesus as revealed through our consecrated local and missionary volunteers and workers who are committed to showing the love of Jesus to those they minister to. The purpose of our trip to Fefan was to reduce the number of unreached islands in Chuuk from thirty-seven to thirty-six. We were there to seek out property for establishing a school and church. By expanding the gospel work to Fefan, it is our prayer that all the young boys and girls on that island will come to know Jesus in a close and personal way and that they and their parents will join the movement to take Jesus to all the other unentered islands in this North American Division mission territory. Ken Norton is the president of Guam-Micronesia Mission of Seventh-day Adventists.